Gegenpressing has been a buzzword in football tactics for the last five years and has garnered more and more attention in the media recently. 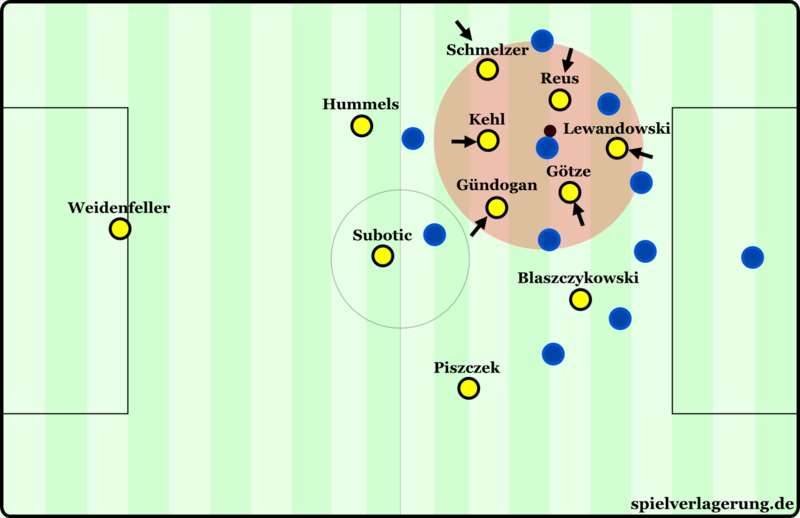 Because of the success of FC Barcelona and Borussia Dortmund, gegen- or counterpressing has been brought up as one of the main reasons for their titles. BVB, in particular, is defined by their style. However, the media often shows a lack of understanding as to what counterpressing really is. Gegenpressing means to press the opposition right after losing possession, i.e. to press as an organized unit the moment you transition to defense. The entire team hunts the ball and, in the ideal case, immediately wins it back from the opponent. The aim is twofold; to prevent the opponent’s counterattack and to win the ball. The English, and even the Spanish and Italians, call it counterpressing and not “Gegenpressing”; in the end the opponent’s counterattack is pressured. In 2008, Jürgen Klinsmann spoke of “immediate ball recovery” and struck at the heart of the matter very well. How does one use Gegenpressing successfully? There are several prerequisites for successful counterpressing. The decisive factor is the overall positioning of the team and their playing style right before attempting to counterpress. The players must play as close to one another as possible so that they can press together as a unit right after the ball is lost – which is a given in short passing football. At the same time, they should not stick so close to one another that they neglect to cover enough space. Usually, a good layout in possession and a good shape behind the lost ball go hand in hand. Some trainers use the basic rule of thumb to “occupy the fewest possible zones with individual players, but the greatest possible distance between the players within those zones so that they don’t occupy the same space” to make the positioning simple to understand; although, with a rule of thumb like this, some aspects are lost in terms of complexity. Many teams also have problems deciding when to stop pressing, i.e. when do you stop pressing if you can’t win the ball back? When should you retreat? How long should you press and with how many players? This is particularly problematic because the position of the ball is always changing. Therefore, there is a commonly used theory – the five second rule. Immediately after losing the ball the team should press at top speed and with maximum intensity for five seconds. If the team hasn’t recovered the ball within five seconds and there is no chance of immediately winning it, they should fall back into their defensive formation. Depending on the team, the number of seconds may vary. It is recommended that the strategic basics of Gegenpressing be coached in order to develop a flexible, situation-specific length of time for counterpressing. It is also important that the team respond very quickly and with anticipation. When possession changes, the players should already be running; next, it is important for the motor response and cognitive reaction to accurately match the manner of the opponent winning the ball and the situation and the anticipation of the possession change. The player must always expect that possession could come, but at the same time assign to the situation a certain percentage and behave accordingly. The observation of the situation and the shape is important. There are a few aspects which should be implemented for an accurate Gegenpressing. Blocking the center of the field is important for a successful implementation. In the middle of the field, the opponent has more options when it comes to rotation, field of vision, and passing. Even if a player arcs their run to block one side of the field, the opponent will have the other entire half of the field to work with. Ideally, the opponent who recovers the ball will be forced in the direction of the touchline or back towards his own goal and away from the center of the field. There, he will have no opportunity to rotate and his choices will be limited, which will also rob him of the most effective and quickest path towards goal, as any counterattack will take longer. Ideally, the opponent will be surrounded from the center out, forcing him to play backwards or square passes and thus isolating him from his teammates. This naturally raises the question of who ultimately won the ball. Some teams only try to cut off the opponent on the ball and attack him passively. Which is good, as one will not be outplayed and the nearest presser has a chance to recover the ball. But, at the same time, the opponents can move freely, slow the game down, and generate more options for themselves. Another option is to run directly at the ball carrier; the opponent is simply pressed aggressively as possible, one does not slow down first or establish the ominous “basketball distance” when challenging for the ball. As a result, the opponent has less time, the pace is quicker, and you can attack more aggressively. At the same time, you will lose the challenge more often, be outplayed or commit fouls. A final method is to deliberately run past the opponent. The opponent will not be slowed down, but the first counterpressing player has no intention of winning the ball. He should merely hand off the opponent and retain his own original position in the cover shadow. As a result, the tempo here is extremely quick and the opponent will be forced into a specific action to which the pressing team can more easily react. The next player attacks and can then win the ball easier. An interesting side note: after the ball is recovered, you can immediately play a clear pass to the player who has run past the opponent. “Clear” here means that the distance is suitable, space is gained, and the teammate knows from the previous situation that he is in front of an opponent. 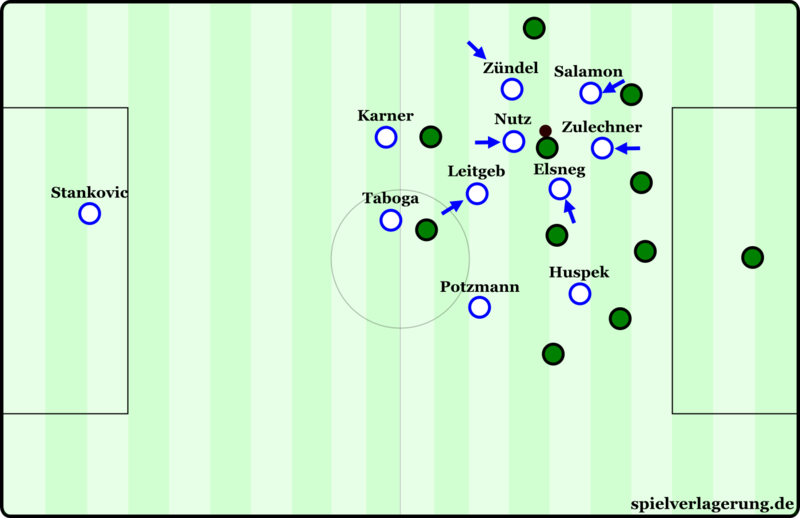 Another article on Gegenpressing with playing examples can be found here (in German). What are the coverage variants? There are basically four counterpressing variants for the various coverages. 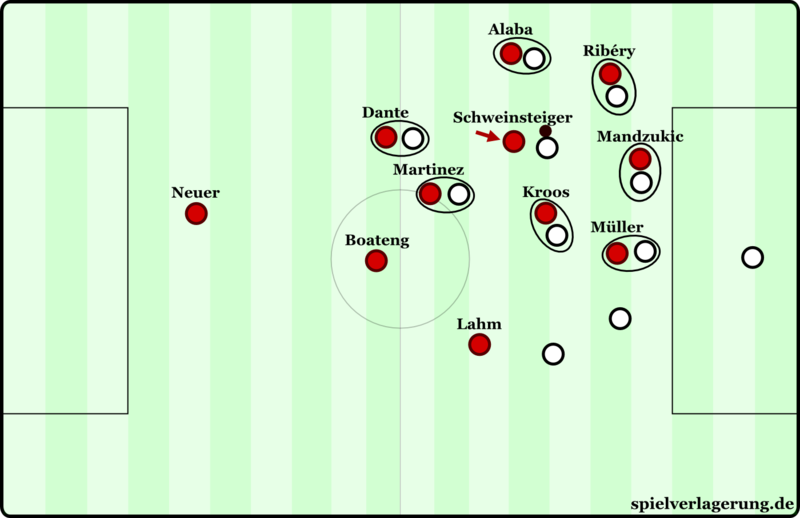 In man-oriented Gegenpressing, one looks for an opponent to cover immediately after his team loses the ball. A player runs up, cuts off the opponent,and forces him into a follow-up action. Usually a pass comes to a player and only after the pass does the ball recovery occur. All nearby passing options should be put under immediate pressure, so that the opponent cannot get free and escape the pressure. FC Bayern practiced this style under Jupp Heynckes. Another option is leeway-oriented counterpressing. Here, there is relatively little consideration for the opponent. Instead, one focuses on the ball carrier, the ball itself, and the surrounding area. The entire team presses in the direction of the ball and seeks to generate the greatest possible pressure. This pressure should force errors, enable the team to cover and support the first pressing player, and simultaneously absorb the nearby passing options in their cover shadow. This intense pressure often causes the opponent to immediately lose the ball or kick it long. 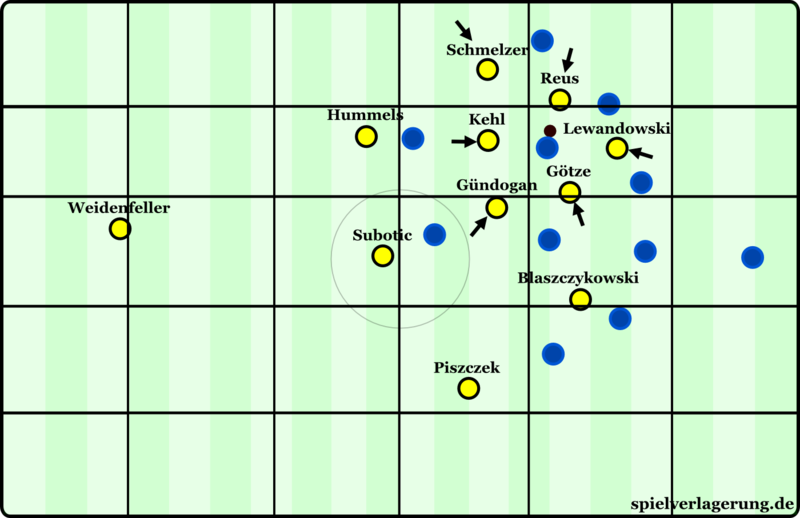 BVB have used this style under Jürgen Klopp. In passing lane-oriented counterpressing the opponent will also be placed under pressure by a player, but here, as in the man-oriented version, the opponent is allowed to make the first pass. In contrast to the man-oriented counterpressing, however, the pass receiver is not attacked, but the pass itself. The aim is to set up between some opponents and then, after the ball is passed, to flexibly recover the ball, trap the pass, or – if things go wrong – have two people press the pass receiver. FC Barcelona used this style often under Pep Guardiola. For ball-oriented Gegenpressing a team simply goes towards the ball without regard for a loss of structure. This means that, on the one hand, a team can achieve maximum pace and aggression, but, on the other hand, will be vulnerable and simplistic. In the 70s, Ajax and the Netherlands national team practiced this style, as did SV Grödig under Adi Hütter last season. Nevertheless, one must not assume – and as a coach must not require – that a certain type of cover always be used. It usually depends on the situation and the options available, which are presented by a team’s shape and the type of lost ball. In most cases it is a mixture of these four coverages. It is plain to see that Gegenpressing is tactically complex, difficult to perfect, and a physically demanding style. The question is, naturally, why should Gegenpressing be practiced and what are the advantages. The most important factor is defensive stability. In modern football, most teams can transition very quickly: the players sprint forward at high speed, the players on the ball are technically skilled, and with the ball at their feet can quickly break through spaces and play good passes. The players are also tactically trained so that the strikers or the wingers are already searching for space to exploit, which makes the counterattack even more dangerous. Furthermore, it is at the moment a team loses the ball that they are disorganized, while many teams have established a philosophy of quick, vertical transitions. If a team attempts to retreat to their defensive positions, then the opponent can advance up the field along with their retreat and quickly gain space as well as play dangerous attacks. Gegenpressing, however, drives the opponent backwards and prevents that. It thereby increases defensive stability; excluding poor implementations, naturally. Yet, Gegenpressing both prevents the opposition counterattack and makes it more difficult to be countered. This aspect goes hand in hand with the first. Even if you could consistently win the ball at a similar level to a good Gegenpressing by retreating, it would not avoid the loss of space and organization. After the ball is recovered you would be deeper and in a defensive shape. The great advantage of Gegenpressing is that the ball is normally recovered in an offensive shape and in a higher position on the field. As you were previously in possession, your players were positioned to attack. A quick ball recovery ensures that you can revert back to your attack. In addition, the opposition will often fan out and open up space that wasn’t available before; this synergy ensures the third great advantage, the increased offensive presence. After the ball is won in high zones via Gegenpressing, you can either “counter” or “gegenkontern” against a team which has just moved into forward gear. They will be poorly shaped in an unsuitable Dynamik, because they want to establish a broad and deep formation out of a narrow one; while at the same time your team are compact around the ball. That it functions not only in theory but in practice and is simply a motor and technical aspect is crucial. The opponent must contemplate during the ball recovery how to attack. This ranges from the looking at the situation and searching for passing options, to the fact that he has to handle the ball first-time when receiving it – which is sometimes even more difficult and technically complicated than receiving a difficult and hard pass. To get into a suitable position to handle this ball, (including making the decision) takes time and can be taken advantage of by a fast, aggressive counter pressing. There is hardly any moment where an individual player is more prone to pressing than immediately after winning the ball. And that is the big secret to the success of Gegenpressing. I have just read it and I have a question about it. Is it a translatable article? I want to translate it into Turkish with all text and photographs and publish it on my own blog – it is sure that I give citation in the begining and end of article- Will there be any problem about copyright. Could you guys layout the blueprints for the way José Mourinho’s teams attack. I mean their counterattacks are the most fearsome and so speedy and breathtaking. Excellent analysis of the nuances behind the name.